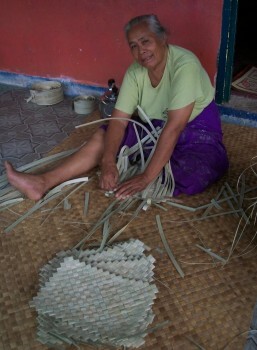 Weaving table mats in Samoa. A cottage industry. In a previous post I shared how Christians should and can conduct their lives in accordance with the clear biblical instruction to avoid usury (interest). This necessitates removing our trading, buying and selling from the world’s usurious financial systems. Surprise, surprise, there is great blessing and opportunity when we do this! In this post I demonstrate in practical terms what this means as people move into a future without usury. First, a quick note on the reference to Christian matters . . . this post is written to and for Christians but it can be applied without these foundations of the Christian faith – it’s just that the basis upon my advice is biblical instruction. Only hard-core fanatics can likely fully extricate themselves from the current entrenched usurious financial systems. You’d need to be in unique circumstances and have a lot of faith and/or specific calling. I’m close to this hard-core cash-free living as I live on a tropical plantation in a third-world Pacific Island Paradise; I’m highly experienced in trading outside of the cash economy (for decades actually); I’m highly creative in business and highly committed to compliance in biblical standards, but it has taken me years of deliberate planning, sacrifice and hard work to get as close as I have to the ideal. But, the more one commits to this aspect of obedience, the easier it becomes; the more natural it becomes and the more blessing that comes. I have previously advised that those recognising that there is something wrong with the usurious monetary practices of the current banking system; and specifically the accursed nature of all Legal Tender money, should be working their way deliberately out of the entrapment that exists. Starting small, getting used to different ways of trading, buying and selling is best. With confidence increasing within a family unit; husband and wife growing in faith and an understanding of HOW the Lord blesses our obedience the doors of opportunity DO open. My ‘soft’ assets have blossomed – things like social goodwill, deeper friendships, greater use of the gift economy, smarter trading practices, IOUs that represent real tangible value to me and my family in the future. Extrication for most will be a process, not an event, but it must start with a specific step of obedience – a decision to act in accordance with the biblical teaching that usury is prohibited. There is a common thought that a computer technology i.e. an RFID or similar will be the Mark of the Beast, and that we as Christians should refuse this technology. This is a false belief for we are all under the Mark at present when we use Legal Tender currencies. To understand this situation, it is necessary to travel back in time to the Roman republic, a unique form of democratic government that existed for a short few hundred years before the Caesars killed it off. The dramatic rise in popularity of democracy in the last 100 years is a revival of a system of man-centric government that lived once, but has come alive again. The remarkable thing about this second instance of democracy is that virtually the entire world is in agreement with Winston Churchill that democracy is the best form of government available to us. Many have died in the wars supposedly in the name of democracy. Speak the truth that democracy is evil and you will be considered a social outcast in a split second. This is willing global idolatry, for the scriptures paint democracy in a very poor light – from the outset where Adam and Eve conspired and voted against God’s word through to the end of the book of Revelation, there is not one (I repeat, not one) instance where God approves of democratic systems, and ALL instances lead to disaster. This is the context in which the Beast appears and receives our worship. Compliance with (which is our idolatry) the democratic political systems and the usurious financial systems is the Mark. It is not a physical thing, it is a spiritual thing – a worship of “man” and his systems. Now removing our allegiance to both of these bondages (in this case we are simply talking the monetary allegiance) is a simple and clear choice – a decision of the mind, and something that any Christian can do at any time. This is the nature of God – to make things very simple, and to provide blessing to those who hear and obey. Making a decision to obey the Lord in financial matters is a costly decision in many cases because it means change. One probably has to choose to avoid a mortgage; to avoid easy credit and material possessions that we would have otherwise enjoyed. Here are some areas in which costs can occur. I highlight benefits as well as the costs for there is always a trade-off. The mortgage. Removing a mortgage can be done by selling down and using equity to buy something mortgage free. Selling other assets to clear a relatively small mortgage is another option. In both situations our standard of living reduces by comparison with others or what we are used to but the removal of interest gains God’s blessing and either increases our cash availability (no more interest payments) or gives us a better standard of living in other areas apart from the “big house”. Credit Card debt. For many, this will mean not having the latest and greatest THING. Passing up on easy access to credit forces a realism in our financial affairs. This realism brings blessing as God always works with facts and reality. It is only the devil who wants us to live in a dream world. Trading without reliance on Legal tender cash. I’ve previously mentioned ways to do this. The cost to do this is increased complexity in conducting trade – it is harder work to engage with real people where they are at, rather than to systemise business and suffer from depersonalisation. Engaging in real relationships takes us back a hundred years or more into the era of the corner store where our grandparents knew the shopkeeper and he knew the entire community (good and bad). It is an incredibly liberating and exciting thing to begin engaging with real people rather than just dealing with digits and numbers. Thus far, I’ve approached this subject from a relatively positive angle. Sadly though, most will not jump for joy at such changes, no matter how much they accept the theory that participating in usurious practices is accursed. Worry not, for the change will be enforced on us whether we like it or not. The book of Daniel and Revelation both talk of a time, many believe rapidly approaching too, when the economic and political systems will implode. According to scripture, so catastrophic will the turmoil be that the politicians will be running into the hills to hide. I can’t wait for that one! Incidentally, the principalities and powers behind the [democratic] political powers will be decimated also and revealed for the fraudsters that they really are, for their power is amplified through the authority that political power gives them. Removal of that political power and they will be reduced to virtually nothing. For the carnal Christians with mortgages and blasé ignorant use of interest-based Legal Tender currencies this will be a traumatic event as they will be forced, cold-turkey to rationalise their lifestyles and find ways to live within their means. My words will be along the lines of. “Welcome to the real world in a thump, bother!” While these events are feared by many Christians they need not be. For those who work in the power of the Holy Spirit, in obedience to the Word of God, avoiding the use of immoral currencies; trading amongst themselves with real people and within their means, such depressions, recessions and trauma will only be opportunity. Rest assured that when the majority of a community loses their primary form of income and their capacity to trade dissolves in front of their eyes, they will be VERY receptive to learning about alternatives. The greater their trauma, the greater their desire to learn will be! This leads onto the predicted persecution, and to the extremes that, quite honestly, puts the fear of God into most of us. What will it really be like when we, as Christians are persecuted, hounded out of our homes, towns and perhaps even targeted for extermination? I’m fortunate that I have seen this process in a controlled manner as I have engaged with Samoa over the last five years, and I can extrapolate this into the big-picture. The first thing is that we often fear sudden, traumatic events that appear to hit us from behind unawares. Sure this can happen but most of my learning has come from gradual step-by-step teaching events as I have stepped out increasingly confidently, dealing with challenges. I view the extreme events (such as Stephen’s stoning and vision), or Jesus’ death on the cross; or the Apostles martyrdom as the culmination of a long series of preparatory events. They generally didn’t come out of the blue. Likewise with adverse financial and political events that we expect and fear. Already we can see an increase in an armed police in the United States. Many can see the Police State developing – increased false-flag events, the Patriot Act, FEMA Camps, loss of privacy and more – and this the same with financial matters. Things will get tougher year after year and people will be more ready to downsize, rationalise and seek alternatives as the money supply is tightened and the squeeze goes on. So that doesn’t change the future, but it does help us realise that we can grow into the extreme situations naturally. Those who understand the basics and act pro-actively and voluntarily of course will be in a far better position to cope, and lead others through their times of crisis. 1. Ownership of a home (even a debt free home) is generally considered an asset. In the coming times of trauma, this will become a liability. Sure it’s hard to see this at present, but I know from personal experience the freedom that removing home ownership from a lifestyle gives. Sprinkle in a little anti-Christian persecution and things will change in a hurry! You say, but that’s extreme. I say yes, but it’s a preparation exercise and once thinking in this way, we start to live it, buying less stuff, thinking of other options than what is currently our normal. 2. The cashless operation is a blessing in disguise. Being able to trade, and live with less and less requirements for the Legal Tender money, that will be getting harder and harder to get our hands on each year now, is a blessing! One of the things that’s hard to understand is that it is BETTER financially to avoid the use of cash, especially when people have less and less of it. So many times I’ve witnessed MORE benefit by trading outside of the cash economy than in it. The skills, wisdom and understanding that one gains from doing this will be INVALUABLE when real trauma strikes. 3. Lastly in an environment of extreme oppression, persecution and suchlike, the carnal mind wants to defend; to retain what we have (be that possessions, power, social standing or whatever) but this is a trap. It is God’s way that when we are at our lowest, that we are in the best position to give. This is SO hard for me to explain convincingly unless you’ve been there already, but it is through giving that we activate the grace of God to have our own needs met. This is NOT just a wishy-washy, give it all away and trust God as you go broke and get desperate pleading, it is a logical, very practical attitude that actively seeks ways to help and bless others while at the same time as getting our own needs met. I’ll give you one example I use to show HOW this can occur. It is a mixture of a real-life scenario with a bit of embellishment as well but I trust it will motivate you to see that it is possible to live richly in the power and purposes of God under persecution. A missionary couple approached me and shared their problems; they wanted to stay longer in Samoa but they had some serious opposition and they couldn’t afford it – they were paying rent and it was hurting them. They couldn’t afford to buy a house and weren’t allowed to buy land not being Samoan citizens. Major vocal sectors of the village didn’t like them or their denomination. I advised them to find a way to give a house away, literally. They were incredulous but I explained that when in a traumatic situation like that, God can work miracles if we only understand HOW he wants us to think. He knows all about our needs and wants even before we ask. Find a person in the village who needs/wants a house and give it to him – literally. Explain that you are seeking accommodation but you can’t afford rent anymore, but you would be delighted to help him build a house if you can only stay in one half of it when you are in Samoa. What High Chief would not offer his lands for such as purpose – a true win-win – half a house given to a local leader (who needed it) and the other half for their own needs – rent free living and forever! And the opposition is neutralised to boot because they now live with a High Chief and has his blessing and protection. The key was the thinking process that was to find ways to give when things were going bad. The process of discovery continued with these missionaries as the subject turned to food. Being low on money they worried about food. Simple I said again – offer the High Chief food every week. They travelled to other villages on occasion and had the opportunity to buy young pigs. For half of their food budget they could bring a steady supply of young pigs to the High Chief who would keep them, feed them and look powerful in the community. The missionaries could double or even quadruple their investment by doing a deal with their neighbour and friend. We’ll bring you the pigs and you share with us the meals each night. Once again avoiding (or minimising) the use of cash, learning to give when in need, and understanding the needs of those around them created opportunity, and everybody won. I commenced this post explaining that extricating ourselves from the clutches of usurious Legal tender moneys and systems was desirable. I finished by explaining that there is far greater opportunity for sound, healthy, profitable, blessed Christian living OUTSIDE of the Beastly political and financial systems of the world. Is that not the way of the Lord, and all we have to do is hear and obey? Thanks for swinging by again today. I’ve enjoyed sharing and there’s a lot more to come as well! I dream a lot . . . about how things could be. A lot of my dreams come true!